It's always nice to review lesser known gems, especially from smaller operations and local joints. 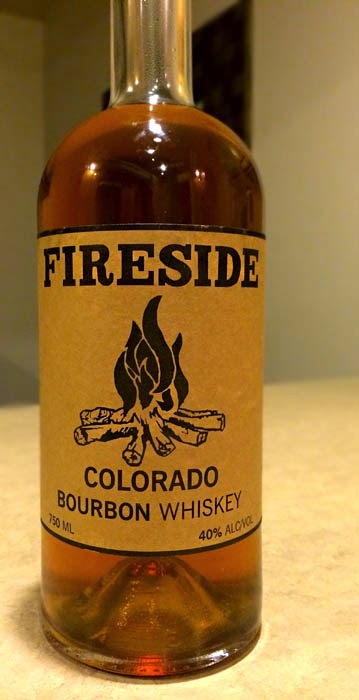 Today's review is the Fireside Colorado Bourbon Whiskey from Mile High Spirits in Denver, Coloardo. Fireside Bourbon is 4 years-old, which isn't too old by larger distillery standards, but for a new distillery getting a 4 year-old aged product is a bit cost restrictive. This is why we often see new distilleries producing lots of "moonshine" and vodkas to keep the income coming in so they can keep their doors open. Fireside Colorado Bourbon Whiskey has a wonderful, rich color for a younger whiskey (although I'm curious as to whether it has caramel coloring added, since a small portion can be added without having to be disclosed on the label, not that I really care though since taste reigns supreme). Aromas are a mellow blend of honey, butterscotch, and a touch of oak. Tasting brings those honey notes from the smell down to the palate, with light caramel, a touch of white pepper, and a distinct oakiness you often find in older whiskeys, finishing with a surprisingly smooth finish that borders on having a creamy mouthfeel. Fireside Bourbon is surprisingly impressive for such a young whiskey. Soft, gentle, sweet and flavorful. It almost reminds me of a couple Four Roses bourbons I've tried. I've already gone through a good portion of my fifth of it, and I have to say, this is most delicious alongside dark chocolate covered coffee beans and the La Harencia Cubana CORE cigars I picked up. Mhhhhhmmmm... This is definitely one I'll be getting another bottle of, if that says anything! Drink This: if you want an impressive young whiskey that's on the sweeter side, becoming almost too dangerously drinkable! Don't Drink This: if you're looking for an older, drier, powerhouse bourbon. This is definitely on the softer side of things as far as bourbons come, but impressive in that respect.